This week Power to Change celebrates its second birthday. We support community businesses that are rooted in their local area and benefit local people, as part of a mission to transform places across England. It is work motivated by the combined impact on our towns, cities and villages of the post-2008 recession and government austerity. In the face of village pubs and shops disappearing, town high streets losing their unique identity and local services closing, community business offers an alternative. And two years on, the case for community business has only grown stronger. Last year’s vote to leave the European Union was the most powerful signal yet that many communities feel disempowered, cut off from remote decision-making and excluded from national progress. Some of this is economic truth: real average weekly earnings are not expected to be any higher in 2020-21 than they were in 2006-7. Living standards have been heavily squeezed over the last decade, and the pain looks set to continue. But this economic reality is compounded by a feeling of loss of control and hope for the future. Community businesses can start to address this on both fronts. Economically, community businesses generate revenue that can be reinvested locally to improve the community. Heeley Development Trust in Sheffield is doing just this. They rent out work spaces to local businesses and refurbish bikes for sale — and surpluses generated by this work go to maintain the park which cuts through Heeley, and is a space for the entire community. Where community businesses can put together a number of revenue-generating projects as Heeley does, they can start to make a real difference to their local area. Just as important is the fact that community businesses give back control to local people. Heeley Development Trust’s board and staff are predominantly local, respond to the needs of local people and act for the benefit of their community. This local connection is a critical part of their business resilience. While austerity is no longer the mantra of the new government, real-terms cuts in spending on public services are set to continue for the next five years. With six years of austerity already under their belts, public service leaders know that salami slicing can deliver little more. Doing things differently is the only option. Community businesses provide an opportunity to do more with less in public services. They bring services closer to people, support people to do more for themselves and connect them to others in their local area, leading to better outcomes and, critically, a greater sense of possibility for the future. Windmill City Farm in Bristol, for example, is far more than a farm. It also hosts a café, a nursery, education facilities and has 400 volunteers. 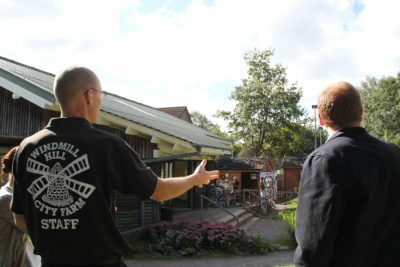 The farm has had particular success in supporting people with mental health problems back into training and employment. Working alongside the farm’s other volunteers, those on the return to work programme are able to rebuild their confidence and skills not through a segregated programme but as part of the community alongside other local people. The results speak for the success of this inclusive approach. Longer term, we face the substantial challenges of our ageing population. The working age population is being overtaken by those in retirement. For the first time, today’s generation is not likely to be significantly better off than the one before, in part because a smaller proportion of the millennial generation will become home owners. This imbalance between the fortunes of those planning for retirement and those entering the work place risks sparking intergenerational conflict and undermining the very foundations of the contract that undermines our society. The need for spaces where the generations come together has never been stronger but civic spaces are being lost. This is where community businesses are stepping in. Brampton Community Centre in Cumbria like many other community businesses now provides this space. It currently receives 65,000 visitors a year and is extending its activities to focus more on creating intergenerational connections to address loneliness among the elderly and provide more activities for families. Community business is not a new idea. Their history dates back hundreds of years. But old ideas are often good ideas and in the case of community business, the case for accelerating their development is only growing stronger.